One of the great things about joining the Dry Dredgers has been the opportunity to meet other fossil hunters, both amateurs like myself and professionals. I’ve learned something about the fossils in the Cincinnatian from each and every member, and, on occasion, I get to participate in actual science! I’d like to share with you the chance to participate in some actual scientific research. 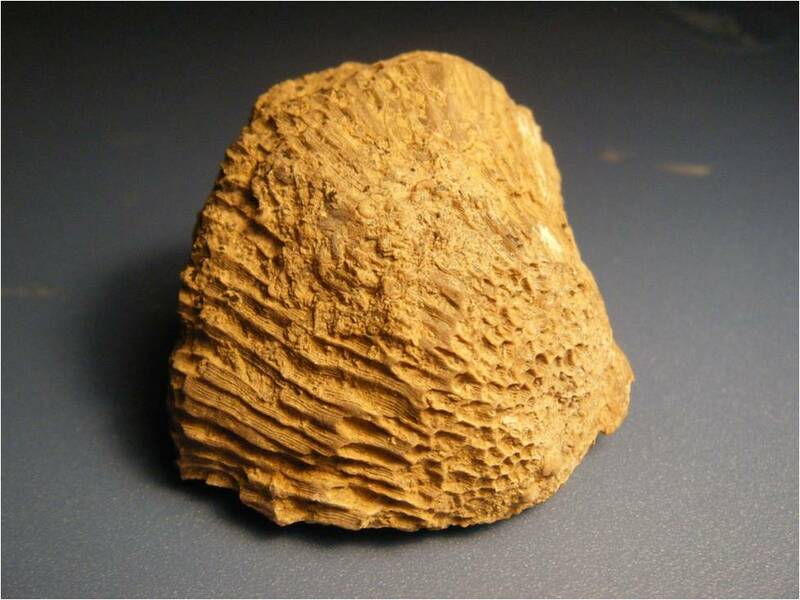 If you’ve been fossil hunting long enough, you know that coral is not terribly uncommon in the upper, Richmondian, formations of the Cincinnatian series of the Ordovician (Whitewater, Liberty, Saluda). If you know your formations then you know that coral isn’t supposed to be found in the Kope. It was too muddy and too deep for corals to be living there. And then there’s this. The coral pictured below is extremely rare. 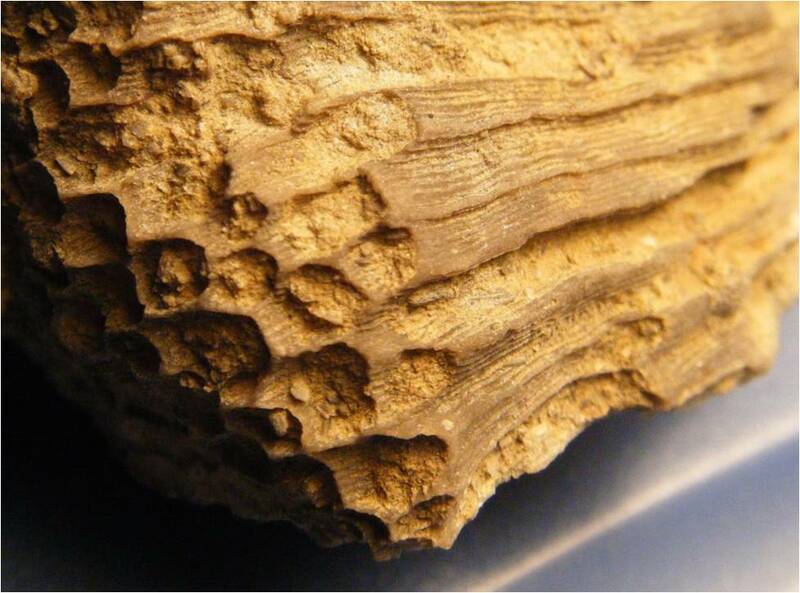 It came from the Kope formation! What on earth is it doing there? 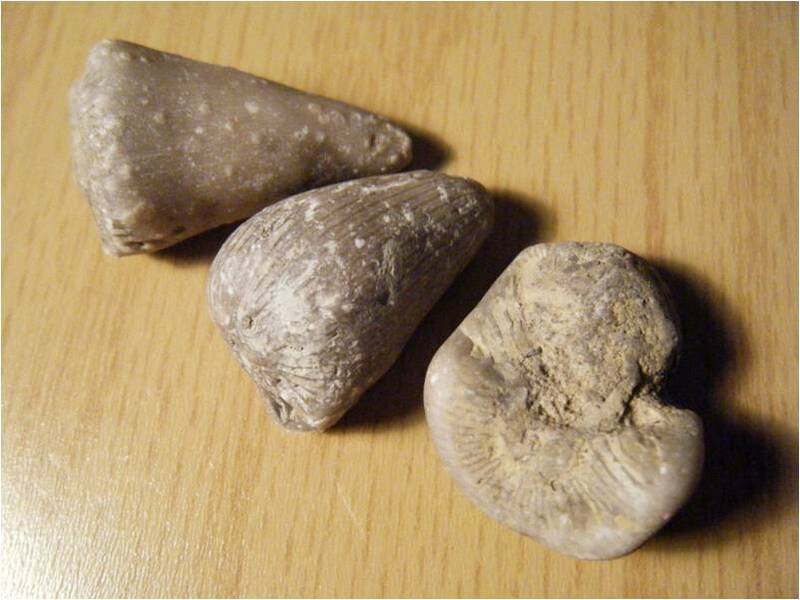 We think we know a lot about our local fossils and the environments they lived in, but sometimes we get a surprise. Over the past fifteen years I have found two specimens that I believe are the same variety of coral. I was told they may very well be an undescribed species. 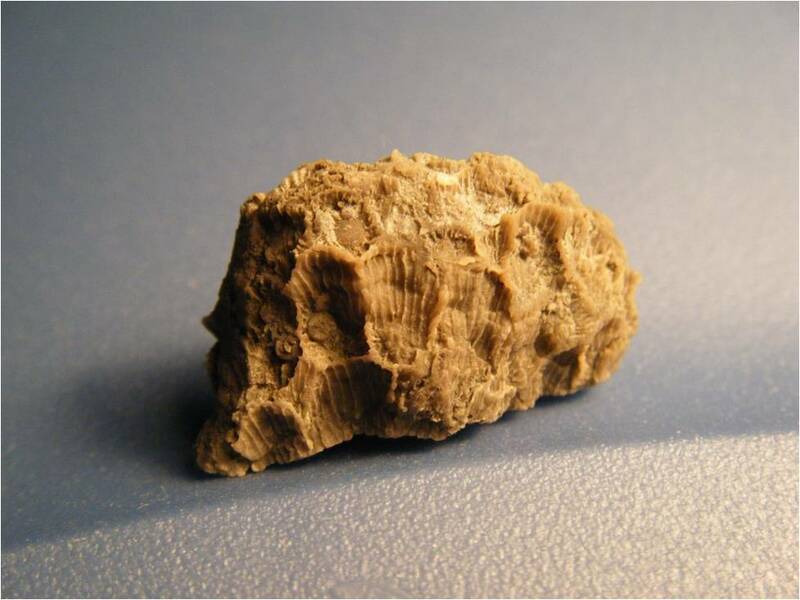 Below is the second coral specimen. I’ve also found two different species of Tetradium, which may or may not be coral. Below is one of the Tetradium specimens. If you are familiar with Tetradium you know that the polyp openings are mere pin pricks, requiring magnification to see any detail. This specimen has polyp openings 1.5 mm across, which is huge by comparison! 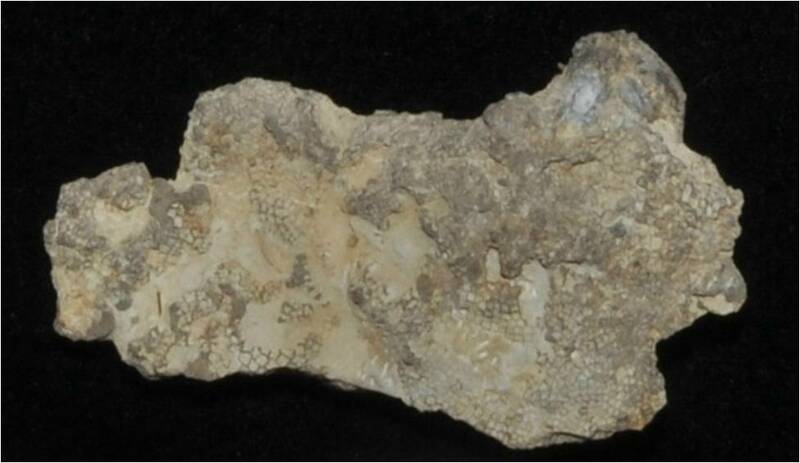 Below is another coral that may fool you into thinking you’ve found Kope formation corals, but they’re actually spillage from Richmondian formations that have washed down. These are Grewingkia horn corals that I found in the Kope, but they do not belong there. They washed down from the glacially deposited gravel overlying the bedrock. You can tell because of the well worn appearance, as if they had been tumble polished in a stream. The specimens above all lack this polished appearance. I can help narrow down where in the Kope you should look. 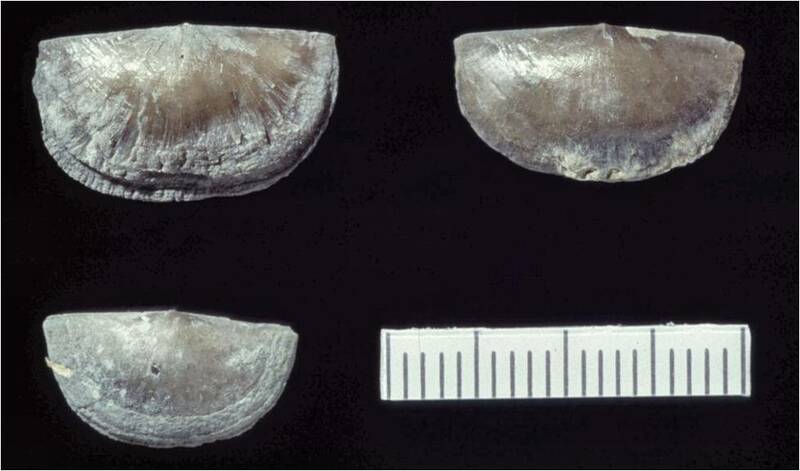 When you find the layers of Cincinnetina or Sowebyella brachiopods, you are in the right area. Now comes the part where you can help. As I mentioned above, it took fifteen years to find just a few specimens. The professionals are few and far between, but we amateurs are far more numerous, and we spend far more time out in the field. There is strength in numbers! Whenever you are hunting in the Kope, keep an eye out for coral! And let me know about it. I’ve heard rumors that a couple people found some in the past, but I don’t know who. If you find one, here’s how you can help; 1) A picture of the specimen, preferably still in place where you found it. We need to know the exact layer, if possible. 2) Record the exact location, including GPS coordinates. 3) Donate your specimen. I can help with that. Why were coral living in an environment we thought was inhospitable to them? Why did they disappear until the Richmondian? If coral was living there, what other surprises might be waiting for us to discover? 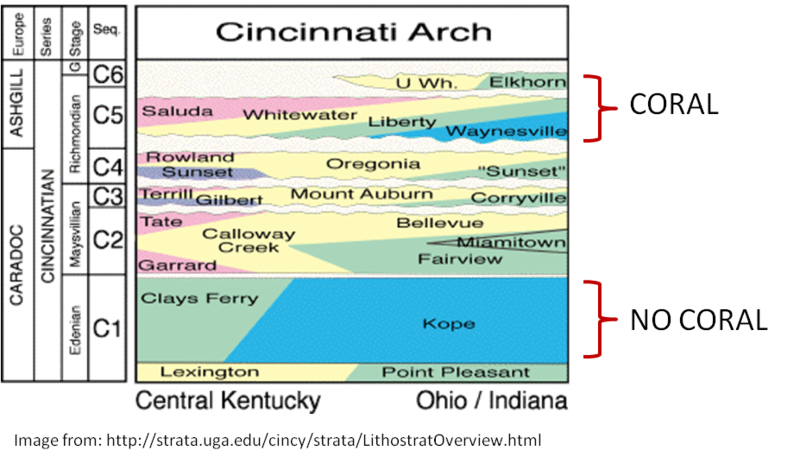 This is an unexplored aspect of the Cincinnatian that we can all contribute to. There is a mystery to be solved, and together we just might be able to unravel it! I really wish you had a chapter of your club in Middle Tennessee! Any chance of that happening? We have some great fossils! Thanks for the nice idea and enthusiasm. Others have suggested we start other chapters and call them “Outcrops.” We are not so well equipped to furnish franchises, however. There are plenty of fossil clubs around the country for people to join. The public just needs to know about them. Have you considered joining the Middle Tennessee Rockhounds? Their website is http://www.rockhound.org. They are based in Nashville. We are also have geology friends with the University of Tennessee in Knoxville. It’s a matter of what’s close to you. Others have thought that all of these clubs need to get together and network ourselves. A NSF grant was awarded for the formation of the F.O.S.S.I.L. project. They now have a list of all the fossil clubs in North America (https://www.myfossil.org/paleosocieties/) and they are actively brining clubs together by providing http://community.myfossil.org. Ahhhh yes! Coral! I have one (2 together)specimen of coral I found in the Kope. No way on God’s green earth can it be called “Glacial!” No wear on it at all and still retains some of the matrix from which it was found.